Microsoft rolled out an update last night for the OneNote app to Insiders that have chosen to Skip Ahead to Windows 10 (Redstone 4); the release bumps the app to Version 17.8568.5751 and adds plenty of new features, which can be seen below. Take quick handwritten notes, and later convert them to text to align with the rest of your content. It'll even preserve the size and color of your ink, as well as highlights and effects! On the Draw tab, click the Lasso Select button. Drag a circle around the text you want to convert, then click Ink to Text. Shows written words, the Ink to Text button, and the converted text words. Grab a pen on the Drawing tab and try out lava, ocean, bronze, and rose gold. Make your notes sparkle! Shows four ink swatches, lava, ocean, bronze, and rose gold. 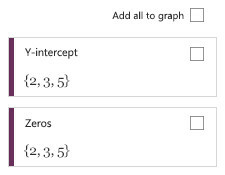 In addition to graphing your function, OneNote can now calculate its key features — such as minima, maxima, or axes intercepts. U se the new Forward and Back arrows above the Home tab to navigate through the note pages you've already visited. Shows visited pages arrows above the Home tab. Create a link to a specific paragraph and jump to that content. It's a great way to make a quick table of contents at the top of a long page of notes, or copy the link and paste it in an email to help others find the specific content you want them to see. 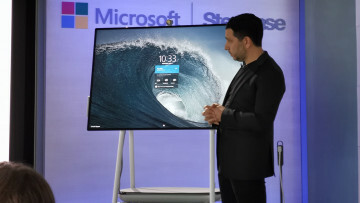 Microsoft also noted that, for the moment, app updates are only rolling out to Skip Ahead Insiders and that "all other Insiders won't receive app updates from the Windows Store until they are released to everyone". Fast and Slow ring Insiders will once again get app previews after the Windows 10 Fall Creators update has been released in October. For now, if you are in the Skip Ahead ring, you can check out these OneNote features right now, or head to the Windows Store to update the app.